Most of us have considered how to build our own storage shelves at some point. It's a common DIY project and a kitchen is often just the place for a few extra storage shelves. 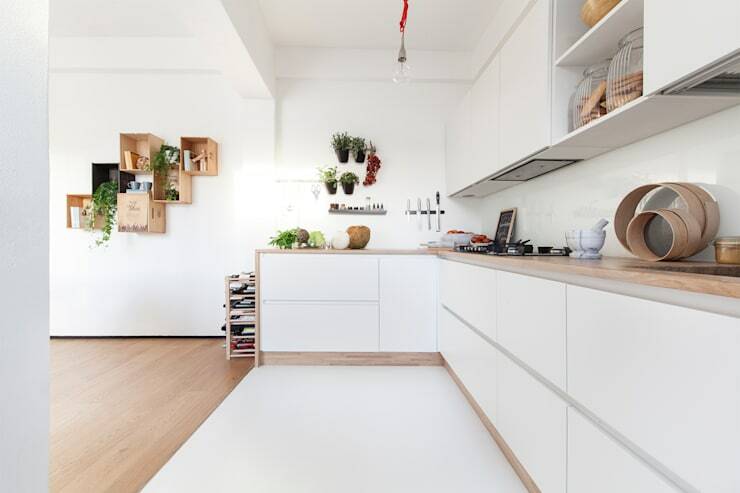 That's because no matter how well thought out a kitchen design, there is always unused storage space in any kitchen. Perhaps you could do with a little spice shelf, a place for those big items or just find yourself staring at an unused corner of the wall and thinking how lovely a few attractive plants and some ceramics might look on display. 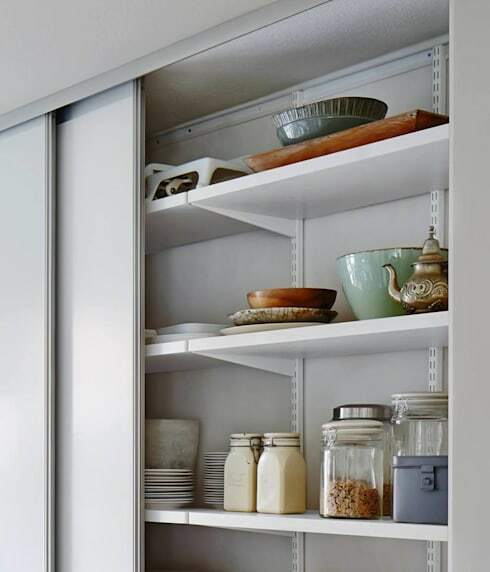 Whatever you have in mind, there are plenty of products and ideas to help you plan the perfect kitchen storage shelves. The great thing about a popular project like this is that it's really well documented and there are lots of almost ready-made solutions available. 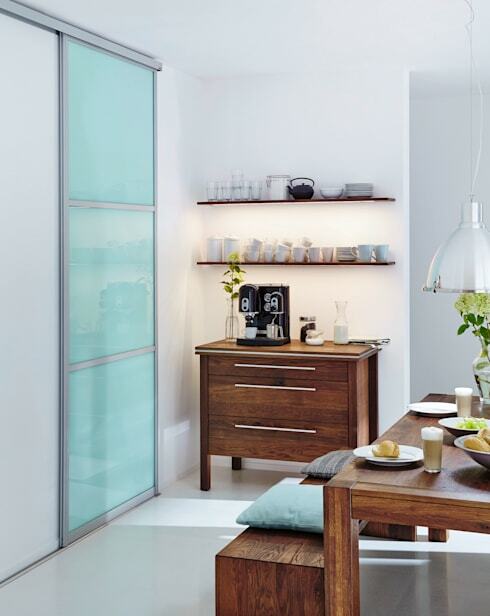 So come with us to explore the ins and outs of track shelving, floating shelves, free standing cabinets and more. There's an old carpenter's saying that you should measure twice and cut once. This means that it's really important to take the time planning your shelves before running out to buy materials. Lay out the objects you might wish to store to get a sense of the dimensions needed. Then make a small sketch of the design you have in mind. It also really helps to mark out the projected shape and size on the wall. Use masking tape or paper if you like for this. This is an invaluable step because it's easy to skew the proportions in your mind when working on a small sketch and lose perspective of how the structure will work within the larger space. Consider that you'll also need a little extra depth to the shelves so your precious plates aren't teetering on the edges. Minimalist style supports are very popular, but it's always good to provide the strongest support possible. Shelves don't just need to support the objects, but the weight of the shelf itself. This doesn't even include the cumulative pressure of repeated wear and tear as pots or pans are dropped into the shelf again and again. Metal strips like this are very effective but the look may not appeal to some. They work well within cabinets like this where they aren't on constant display. They can also work well in more industrial style homes. L-shaped brackets are usually very sturdy and are available in minimalist, rustic and highly ornate styles. If you want something a little simpler, consider wooden blocks or strips. As with any of these choices, the strength of the support is dependent on adequate penetration into a solid wall that is preferably made from concrete or brick. Before drilling, don't forget to check the location of hidden piping and electricity lines. The chances are that you'll want your shelves to blend perfectly into your existing kitchen cabinetry. Take the time to measure and measure again so the depth of your shelves transition perfectly into the existing wall cabinetry. Choose similar colours and take the time to properly finish off the edges. Consider the proportions of the existing cabinetry and try to space the shelves in a similar configuration. 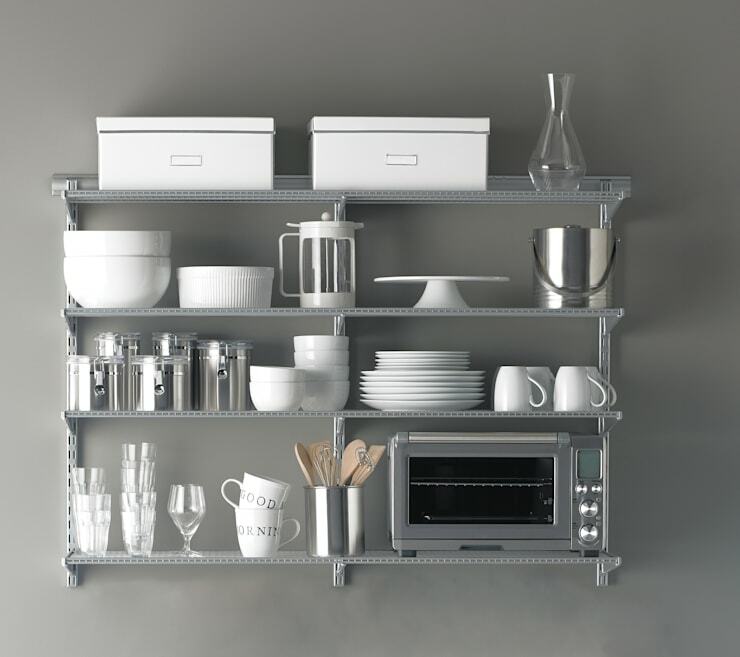 Floating shelves are an extremely popular option because they have no cumbersome supports. But this benefit can obviously be a liability in practical terms. As mentioned earlier, it's crucially important to design with adequate support in mind. This style of shelving is really good if you want to display some lightweight ornaments or decorative arrangements. Don't forget that the best part of being a DIY pioneer is that you have the freedom to design something utterly unique. Consider the possibility of upcycling old crates, palettes or odd bits and pieces. 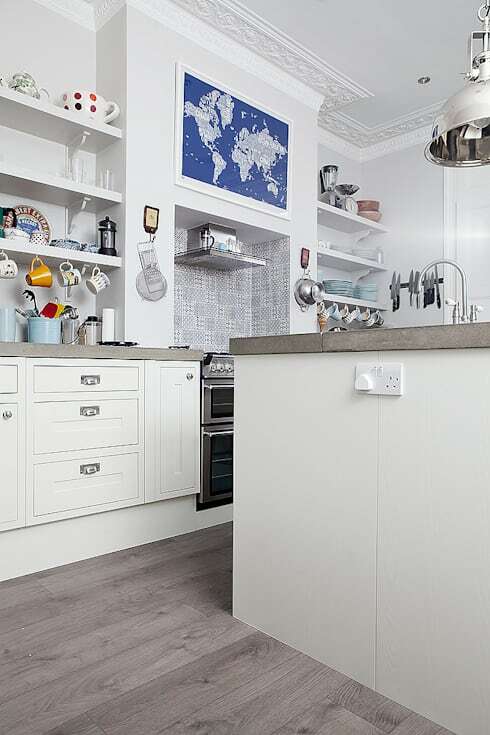 Just look at the upcycled wooden crate shelves on the far left of this white kitchen. The rustic look doesn't appear to blend into the contemporary kitchen at first glance, but it works because the timber tones match the wooden kitchen bench. All you need is one, little common element to hold the look together. We hope you enjoyed this Ideabook, if you are interested in DIY projects, you'll love this Ideabook 6 ideas to create DIY home textiles.